Everyone loves to praise phones with premium materials such as metal and glass. The only problem with them is durability. Drop a phone with glass and it is practically guaranteed to shatter. Drop a phone with metal and it is going to get nicked and scratched. There is a large group of consumers ranging from construction workers to overall clumsy people that require phones capable of handling drops, spills, and even dust storms. 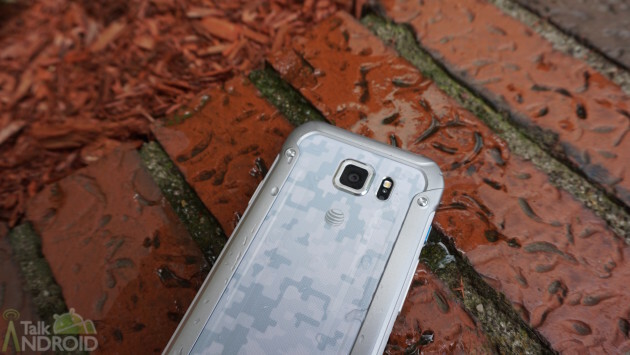 This summer, Samsung and AT&T have worked together yet again to release the Galaxy S6 Active. The phone stays true to the regular, flagship Galaxy S6. Both phones have the same stunning display, speedy processor, and large camera sensor. Really, it’s all the same! So what’s different here? The Galaxy S6 Active’s design will brace it for impact and handle itself in just about any risky situation. 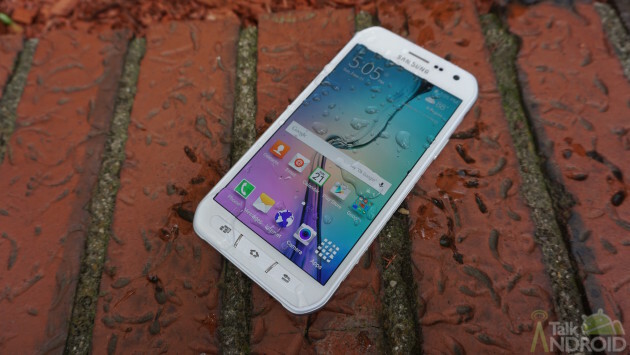 Note: This review will primarily cover the areas that differ from the Galaxy S6. Preventing the phone from shattering and malfunctioning in extreme conditions is a design completely different than the metal and glass used with the Galaxy S6. The two aforementioned materials have been swapped out for plastic. Samsung had to use plastic, its former go-to material, for the entire casing of the phone because of how it manages falls; however, the plastic here does not look or even feel cheap like ones released by Samsung in the past. The right side of the Galaxy S6 Active shows the power button and houses the SIM card tray. The left side, in addition to the volume rocker, has a special Active key button to showcase what the phone is all about. 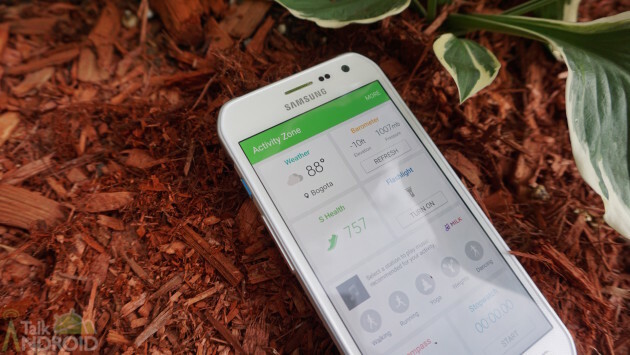 Pressing the button once activates Samsung’s Activity Zone to assist with any outdoor excursion. Upon a long-press, this button acts as a shortcut to any app installed on the phone. The Activity key should be something all phone manufacturers consider because of how useful it is to have a quick shortcut to any app. The button setup on the front of the Galaxy S6 Active is familiar yet slightly different. Samsung placed three physical buttons — Recents, Home, Back — below the display. None of the buttons on the phone are loose. Each has firm placement and a generous ‘click’. 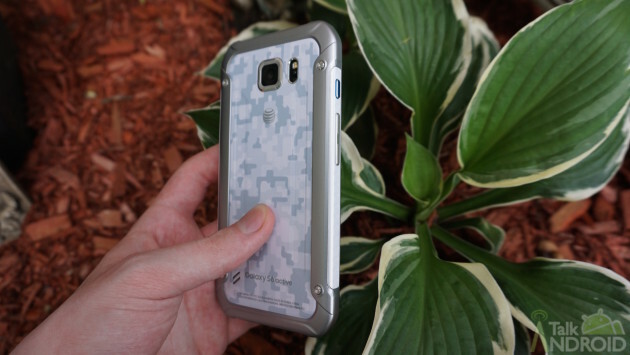 AT&T has three color options available: Grey, Camo White, and Camo Blue. The latter two, as their names suggest, feature camouflage patters on the rear. 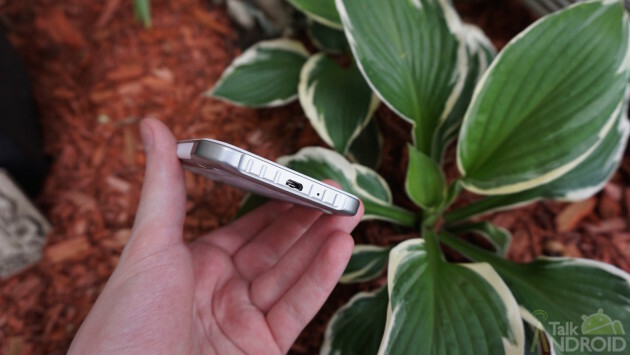 The same spot feels subtly textured and assists in gripping the Galaxy S6 Active. All buttons on the Galaxy S6 Active are textured, too. And along with the sides having multiple indentations, it will be very difficult to accidentally drop the Galaxy S6 Active out of your hand. The durable design comes with the certification to prove it. The Galaxy S6 Active’s casing is IP68 certified, meaning that the phone is water resistant, shock resistant, and dust proof. 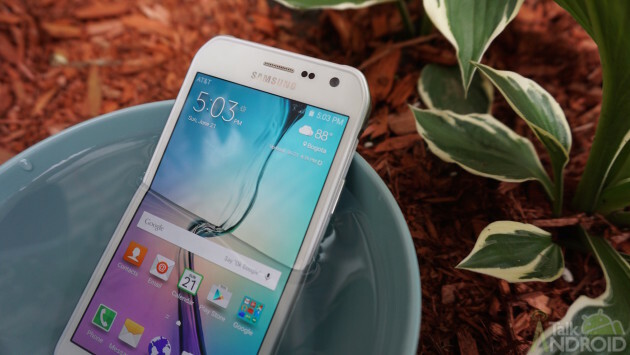 The Galaxy S6 Active can survive in up to 1.5 meters of water for around thirty minutes. You may find it hard to believe that the Galaxy S6 Active can withstand being dunked in water despite having a few openings. Well, Samsung coated the openings to keep them safe. Water will not enter through the micro-USB charging port and audio jack. I put the Galaxy S6 Active in both a small bowl of water as well as a sink with some depth and the phone functioned properly both while being submerged and after. The Galaxy S6 Active measures 146.8 x 73.4 x 8.6mm and weighs 150g, making it bigger and heavier than its sleek and slender sibling. The Galaxy S6, by comparison, measures 143.4 x 70.5 x 6.8mm and weighs 138g. The cause for those figures increasing with the Galaxy S6 Active is the IP68 certification requiring better security and the battery’s size. 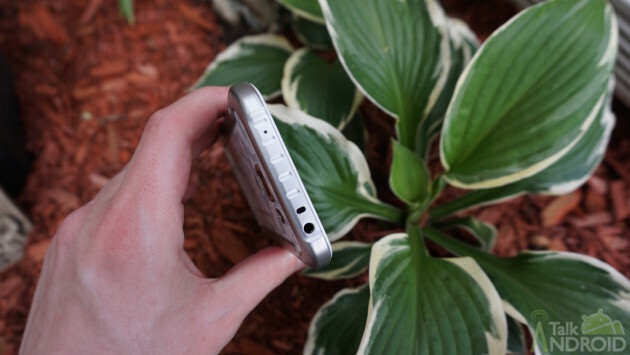 Although plastic has nothing on metal and glass, the Galaxy S6 Active feels comfortable to hold. The indentations and texture in different areas of the phone work together very well. The Galaxy S6 Active features a 5.1-inch Quad HD (2560×144) Super AMOLED display (576 ppi), Exynos 7420 processor, Mali-T760, 3GB of RAM, 32GB of internal storage, 16MP rear camera, 5MP front camera, 3500mAh battery (non-removable, wireless charging supported), WiFi 802.11 a/b/g/n/ac, and Bluetooth 4.1. Being that this phone is available exclusively through AT&T, the Galaxy S6 Active operates on their GSM, HSPA, and LTE networks. People looking for an unlocked phone with identical specifications will have to revert back to the regular Galaxy S6. With high resolution displays and a ton of horsepower running the show, battery life can become strained. Samsung, thankfully, raised the size of the battery within the Galaxy S6 Active. Rather than being a meager 2550mAh like the Galaxy S6, the Galaxy S6 Active has a massive 3500mAh battery. The Galaxy S6 Active leaves behind the regular version as usage time spills into two days. I generally use my phone for messaging, tweeting, email, and the occasional light mobile game. People have complained that the Galaxy S6’s battery life is disappointing but the same cannot be said for the Galaxy S6 Active. It goes and goes… and goes. Oh, the Galaxy S6 Active also supports wireless charging. 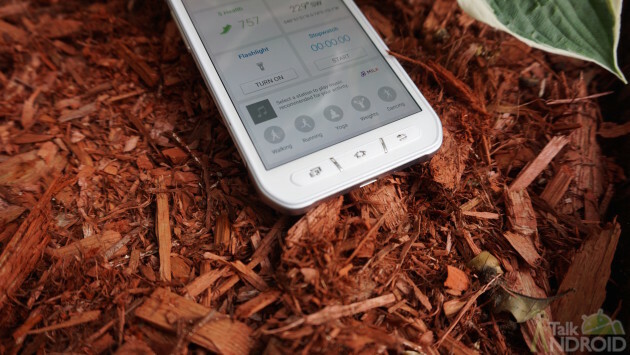 The software present on the Galaxy S6 Active is the same installment of TouchWiz that the company used with the Galaxy S6 and Galaxy S6 Edge. If you have used either one of those two phones, nothing will surprise you about the Galaxy S6 Active. All of them have the latest version of Samsung’s TouchWiz user interface. Here, it is based on Android 5.0.2 Lollipop while the other two phones are starting to see Android 5.1 already. 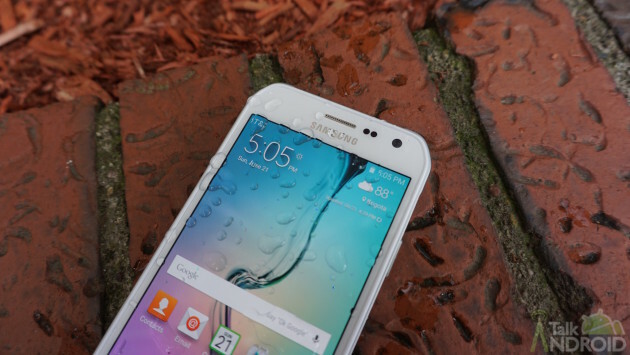 AT&T has yet to say if and/or when the Galaxy S6 Active will get the same software update. TouchWiz seemingly no longer slows down Samsung’s phones and the Exynos 7420 probably helps with that. Moving through the user interface is smooth and consistent, never does the phone resemble a sleuth. The camera also starts snapping photographs almost instantaneously. Samsung and AT&T are really pushing the outdoor capabilities of the phone and that is the reason a special hub known as Activity Zone. Launching Activity Zone can be done through the dedicated Active key button or tapping the app icon. Activity Zone displays various tiles: Weather, Barometer, S Health, Flashlight, Compass, Stopwatch, and Milk Music. The tiles can be extremely useful in different situations and most are shortcuts to another app when selected. The tile that stands out here is Milk Music. Activity Zone asks you to select among walking, running, yoga, lifting, and dancing before songs start playing. Expect plenty of pre-installed software that does not belong to Samsung. There are around twenty apps on this phone that come from either AT&T or another company that is not its manufacturer. The Galaxy S6 Active costs $694 without a commitment of any type and that number drops to $199 when signing a two-year contract with AT&T. The carrier also has its AT&T Next payment plan to split the cost of the Galaxy S6 Active across twelve, eighteen, or twenty-four months. Surprisingly, the off-contract price is higher, albeit by $10, than the Galaxy S6. A design targeted at those needing something durable but uses cheaper materials requires a few more dollars. That seems confusing but maybe there is a need this phone. Some people are drooling over the massive battery, which could also be enough to buy the Galaxy S6 Active, and they should because it bests the top phones on the market today. But is that good enough to buy the Galaxy S6 Active over the Galaxy S6? Probably not, unless you tend to break your phones (and don’t have insurance) or work in an environment where anything can happen. Then it’s a perfect match.